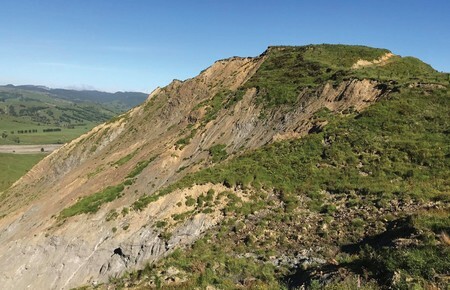 Erosion of our East Coast North Island hill country has been a problem since deforestation began in the 19th century. As each year passes, more and more soil is lost to the sea, and the scenario is likely to get worse as climate change brings more frequent intense storms, increasing soil loss. Erosion flow-on effects continue to slowly degrade land productivity, reduce quality of life for rural communities and increase sediment loadings to rivers. The Whangaparaoa 2L Trust are kaitiaki of Mataroa Station, nearly 2,500 ha of steep, erosion-prone land on the East Coast. Their ability to continue farming the station, and to bring their vision of environmental sustainability and community resilience to life, is dependent on stabilising some of their more vulnerable land. To combat the severe gully erosion that has become a serious problem on the trust’s land, they began looking for ways to manage and stabilise it, securing its resilience for generations to come. The trust together with Scion secured funding from MPI’s Sustainable Farming Fund (SFF) and Erosion Control Funding Programmes (ECFP) to research the survival and benefits of different plant species for erosion management, and to reforest 64 ha around the trial area. Planting vegetation is a recognised method for stabilising eroding land. Plants reinforce the soil through networks of roots, and slow run off by collecting and holding rainwater. They also have other benefits including carbon sequestration, timber production and habitat creation for native species conservation. Planting manuka can also offer the opportunity for honey production. Equipped with knowledge of the trees’ survival rate, and their associated cost and benefits, will allow the trust to make informed decisions about their land. The project team worked with trustees to understand what they wanted planted on their land. Lead scientist Loretta Garrett says, “Sharing knowledge and the opportunity to work collaboratively with Scion was very important for the Whangaparaoa 2L owners. We surveyed the trust to find out which species they’d like to see planted on the land and matched this up with science to find the best options to trial”. Securing the environmental resilience of the land is a key priority for the trust as well as balancing the economic, social and cultural values that underpin their livelihood. The trial tested the survival of a range of different species planted on the trust’s land in September 2015. Species planted included manuka, a mix of totara and willow poles, coast redwoods, and eucalypts. The addition of willow poles to totara accelerated the root spread in the early years while the totara were establishing, to be removed at a later time. Vetiver grass, which has a deep rooting system, was also trialled in some of the very severely eroded areas within the gully scar. All plantings were compared to radiata pine as a benchmark. The costs and benefits of each species were valued over a 120-year timescale. The project team completed their final monitoring visit in November 2016, tallying up which species had survived. The final report will be presented to the trust and people interested in the work at a hui in autumn, 2017. The results will also be published as a brochure so other communities around the East Coast can benefit from the findings.